Real bookmark for a real book. Yes, e-readers are fantastic and we would be lost without them, but – – – – some books need to be read in their paper versions!!! A dolphin leaps from the top, waves and water life are deeply cast on the pewter below. Sapphire blue Swarovski Crystals hang from the end. The bookmarks are approximately 3 inches long. 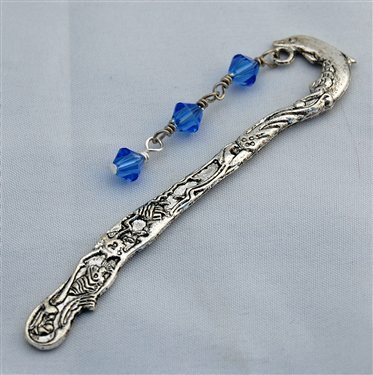 Imagine opening a Jane Austin, or a Jules Verne and slipping this gorgeous bookmark between the pages after immersing yourself in far off times and places. That is luxury!